I wish I could say Yes to your inquiry about the possibility of Mrs. Wilson and I being in Staunton at the time of the annual meeting of the Virginia Press Association, but I know perfectly well that we cannot. 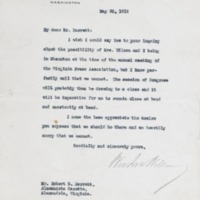 The session of Congress will probably then be drawing to a close and it will be imperative for me to remain close at hand and constantly at hand.I none the less appreciate the desire you express that we should be there and am heartily sorry that we cannot. Wilson, Woodrow, 1856-1924, “Woodrow Wilson to Robert S. Barrett,” 1916 May 30, WWP20510, University of Virginia Woodrow Wilson Letters, Woodrow Wilson Presidential Library & Museum, Staunton, Virginia.